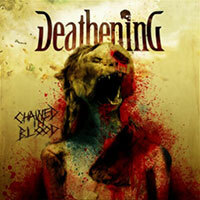 It's not as if there's anything new under the sun on 'Chained in Blood' by Swedish Deathening. But the album is well-wrought and contains the diversity which it takes for a guy like me to stay interested. In terms of genre, I'd put the marker firmly in the Gothenburg brand of death metal. An In Flames influence can be heard in there without a doubt, and it's not a bad thing - especially because Deathening have accomplished to avoid sounding like a clone of their peers. On the contrary, they manage to provide the by-now standard recipes with a slight twist which I can best describe as an addition of an epic element as well as, especially in terms of vocals, to be a tad more brutal, aggressive and unpolished. The song Bleed is a good example of this epic element. A rock solid delivery by the Swedes and a recommendation for all fans of the Gothenburg sound.